Imagine if no one kept their promises? What if laws were nothing more than ink on paper? And what if no one honored relationships? The world would be thrown into total chaos. Instead, you pick up your shirts from the cleaners on Monday because the dry cleaner promised them ready at this time. Your paper arrives each morning because a bunch of writers, editors, and production professionals promised to deliver it over night. Customers pay your invoices to them within terms, and you pay your bills on time as well. 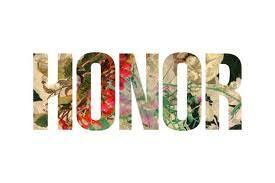 Of all the virtues of the world, honor is the glue that holds the world together. From an action as simple as showing up on time for an appointment, to keeping a significant lifetime commitment, it’s honor that defines the moment. The incredible story of the musical Jersey Boys chronicles how Bob Gaudio and Frankie Valli kept a handshake agreement to evenly split their combined income, regardless of who was earning more any given year. They honored this pledge for over fifty years, and in the process truly honored each other. Let’s be very clear. Being honored and having honor are two entirely different things. An “honorable” public official may be anything but! Likewise, a badge that’s earned through an act of heroism is unquestionably an honor, but the kind of honor I speak of can only be lost through inauthentic actions. Simply put, to honor is a verb meaning “treat with respect.” Antonyms include “betray and disgrace.” You can’t live authentically without exhibiting honor in every one of your actions. In pursuing your dreams, you should certainly be “true to thyself,” but you also must honor the world that surrounds you—family, friends, colleagues, customers, tangential relationships, and the laws of society, or you will be building your destiny on top of shifting sands. A sustainable life in crescendo can only be build upon a rock-solid foundation.